Ever since I got the Fitbit Charge HR with continuous heart rate monitoring, I noticed that it sometimes reported much higher than expected heart rates while exercising. I would often get peak heart rates of around 185 bpm (beats per minute) which is actually impossible, according to the 220 minus your age rule. According to that rule, my maximum possible heart rate is only 170 (yes, I'm that old now!). At first I thought it was simply reporting one and a half times the actual heart rate, but with some experimentation and analysis, I found it was a more subtle ratio. Here are two identical walks that I took at lunch taken 10 days apart. They have the exact same route (maximizing Pokestops), and a bunch of hills. The hills account for 21 flights of stairs, or approximately 210 feet climb in altitude, including these sets of stairs here. There are only 3 of 5 flights shown in this photo! The pace was a little slower in the second walk, but somehow that finally got the Fitbit to measure the correct heart rate! This was the only time (out of close to a hundred walks) that I didn't get a ridiculously high heart rate recorded. Here are the two heart rate plots recorded for these walks. The peak heart rate the Fitbit records is 183 bpm in the first plot. 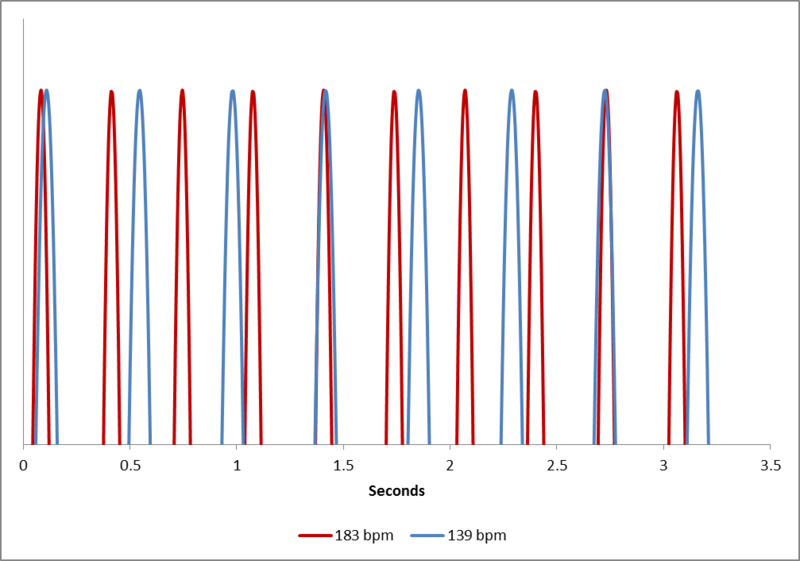 In the second plot, it's only 136 bpm, with no time in the peak heart rate zone, which I believe is accurate. I try to check my Fitbit during the walks and when it's not measuring correctly, there's usually two dashes in the heart rate display. I've gotten measurements at the top of these stairs and it is usually somewhere between 134 and 140 bpm. Surely a good cardio workout, but not pushing the physical human limits at 183 bpm! 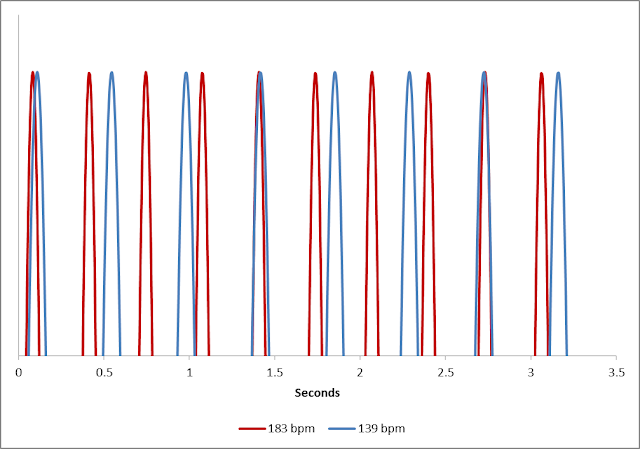 The steps are close to the middle of the walk, so it coincides with the peak heart rate of the second plot. If you simply divide 183 by 136, you get a 1.346 ratio. It's not a simple 1.5 ratio. Maybe the Fitbit takes into account the maximum human limits. It knows my birthday, yet it can't keep the peak heart rate below 170 bpm. I decided to plot 183 and 136 bpm to see how the beats fell against one another. I did find a correlation between the 3rd beat of the lower heart rate and the 4th beat of the higher heart rate, which is a 1.333 ratio. I adjusted the lower number to 139 bpm (within the range that I measured during the walks) to further show this correlation. It could be that the Fitbit doesn't measure heart rate as many times a second as you expect, or the algorithm is just off. It clearly states that it cannot be used as a medical monitoring device, and that's evident from my use of it. If and when I get a new Fitbit (all of ours are falling apart after 1.5 years), I'll be interested to see if there are improvements to the heart rate monitoring.